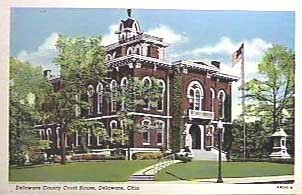 Delaware County was formed from Franklin in 1808, County seat is Delaware. Union County was taken from Delaware County in 1820 and Morrow County in 1848. Above tax list received at Auditor's office Nov. 24, 1810; recorded Dec. 1810. Therefore, when searching Delaware County, also search Union, Morrow and Franklin Counties in the areas that were taken and/or added to Delaware County.